George H.W. Bush was a rarity among presidents—a normal guy—says the author who spent nine years researching and writing the best-selling biography of the 41st U.S. president. “You could go camping with him,” said Jon Meacham of the first George Bush to become president. “You could have a beer with him. Meacham made the observation during a Presidents Day forum Feb. 15 at Langford Auditorium on the Vanderbilt University campus. 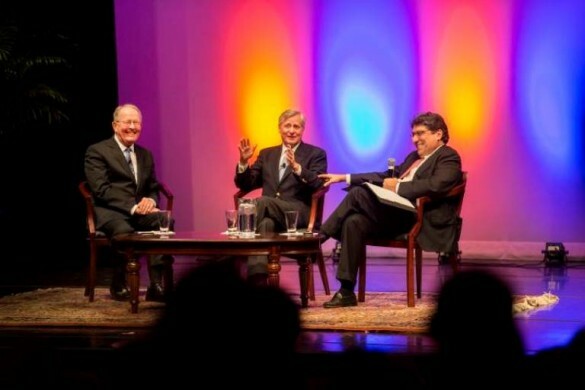 The forum took the form of a conversation between Meacham, Vanderbilt Chancellor Nicholas S. Zeppos and Sen. Lamar Alexander (R-Tenn.). 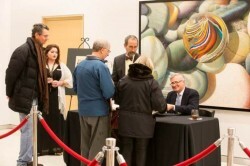 The event was part of the Vanderbilt Chancellor’s Lecture Series. “He (Bush) always understood how the other guy felt,” Meacham said. As a child, Bush habitually cut his desserts in half so he could share with another child, Meacham added. “He understood divided government and knew you can’t always get your way,” Zeppos said. Meacham, a Distinguished Visiting Professor at Vanderbilt since 2013, is executive editor and executive vice president at Random House. He was awarded the Pulitzer Prize for his biography of Andrew Jackson, and his book about Thomas Jefferson was a No. 1 New York Times best-seller. Bush, whose father was a Wall Street banker and U.S. senator, was not so normal that he didn’t have grand ambitions. Meacham said the first time Bush mentioned the possibility of becoming president was in 1965. Throughout his presidency, he dictated notes of his daily reflections with an eye toward history. 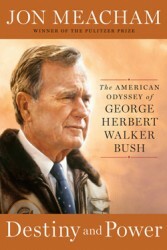 The motivational force that drove Bush was his survival after being shot down by the Japanese during World War II, Meacham said. Bush survived while two of his crewmates didn’t make it. Bush would “break down in tears” when reminded of the events, and his life afterward was a “headlong attempt to prove he was worthy” of surviving, Meacham said. Bush’s military background also made it hard for him to understand his loss to Bill Clinton in the 1992 presidential race, the author said. The military veteran had a hard time accepting a loss to an opponent who seemed to have avoided serving in the armed forces. “I always thought it was duty, honor, country,” Meacham said Bush dictated into his records the night he lost the election. “I never felt out of touch, but maybe I am. He’s George’s age,” Bush noted in referencing Clinton and George W. Bush. Alexander brought a bit of current news to the event, commenting on whether President Obama should nominate a successor to Supreme Court Justice Antonin Scalia, who died Feb. 13. Alexander said Obama should not make a nomination, because “the American people deserve a voice” in the next justice on the court.